Excellent small camera with built-in Professional SDX-1 transmitter for 2.4 GHz FM band in frequencies: 2410 MHz, 2433 MHz, 2452 MHz and 2472 MHz. This is the smallest video receiver on the market for 2,4 GHz with amazing sensitivity and easy to use. It is fully synthesized and built in a small plastic case size 76 mm X 68 mm X 25 mm. This receiver is adjustable using the special proportional PLL tuning on the side of the box. Also it is available version as a SINGLE CHANNEL UNIT with a preprogrammed channel. It will work from 10 V- 14 V DC. This is a special design for the specific application where the size and quality is the main factor. Video out is 1 V / 75 ohm. This receiver doesn’t have an audio portion. This unit complies all FCC standards! High gain antenna can be connected via an SMA connector for the best performances and range. 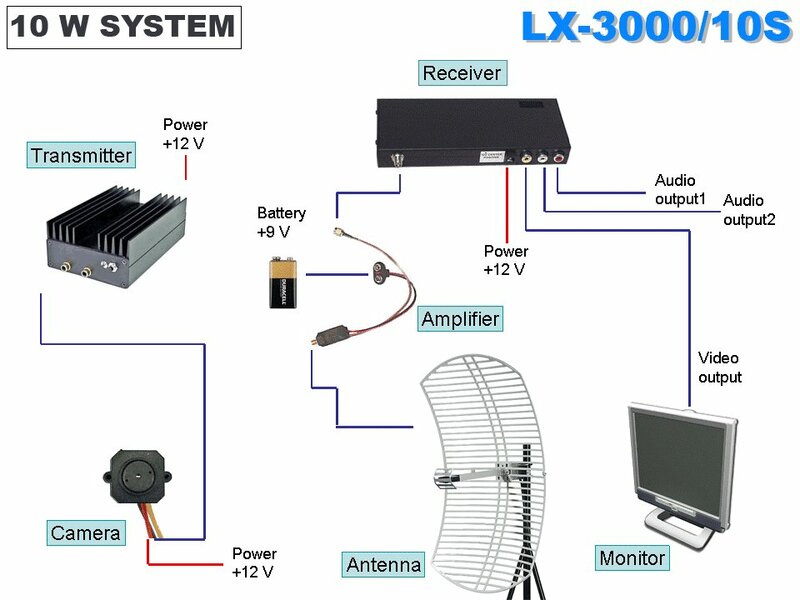 Audio-video transmitter LX-3000 has 8 channels in 2.3 MHz - 2.5 GHz range. This unit has wide temperature range from -40° C up to 75° C! The range of this system is app. 20 miles from the AIR using special antennas and our receivers VRX series! Recommended receiver is VRX 24 L. This High power Audio/ Video transmitter measures 6" X 3" X 1". A special heat sink is built in the box. Transmitter weights 230 grams. This special transmitter doesn't need any maintenance or tuning. The frequency setting is external - you can choose 8 channels in 2.4 GHz range by pushing the button. RF power output is over 5 W / 50 ohms load. Recommended antenna is dipole 5 dB gain AD-24S. This is a World's smallest 2.4 GHz video transmitter made for special applications. This transmitter is a single channel unit and comes in 8 different channels in 2.3 GHz - 2.5 GHz range. This unit can be used in the wide temperature range -40° C up to 75° C! The range is app. 5 miles line-of-sight from the AIR! Weight of this transmitter is 12 grams. 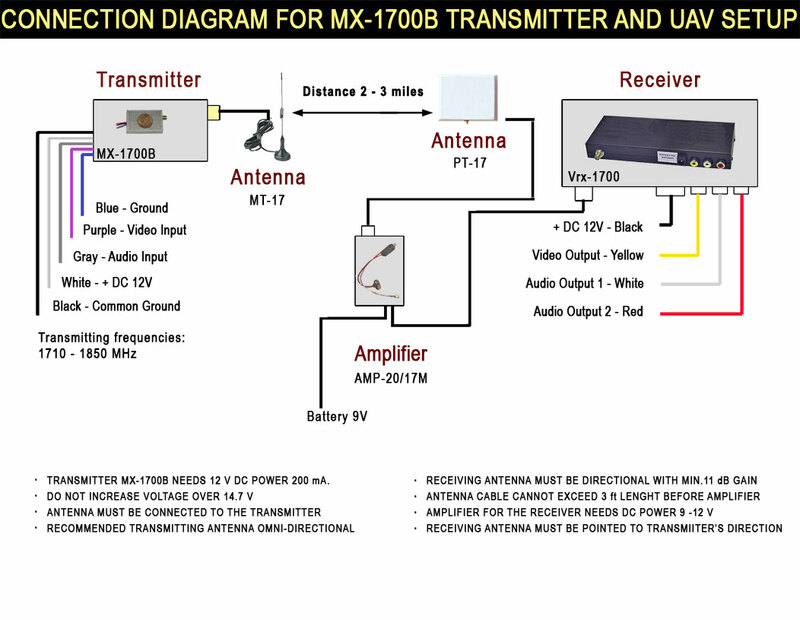 Audio-video transmitter MX-3000 has 8 agile channels in 2.3 - 2.5 GHz range. It is extremely small, light (8 grams), sophisticated unit that will work from 6 V battery power! This is a great audio-video transmitter for MAV applications excellent for a special flying models where the weight and battery power are critical factor. With receiver VRX 24L you can obtain distance over 3 km from the Air using special high gain antenna on the receiving end with amplifier model: AMP-18M/24 ! 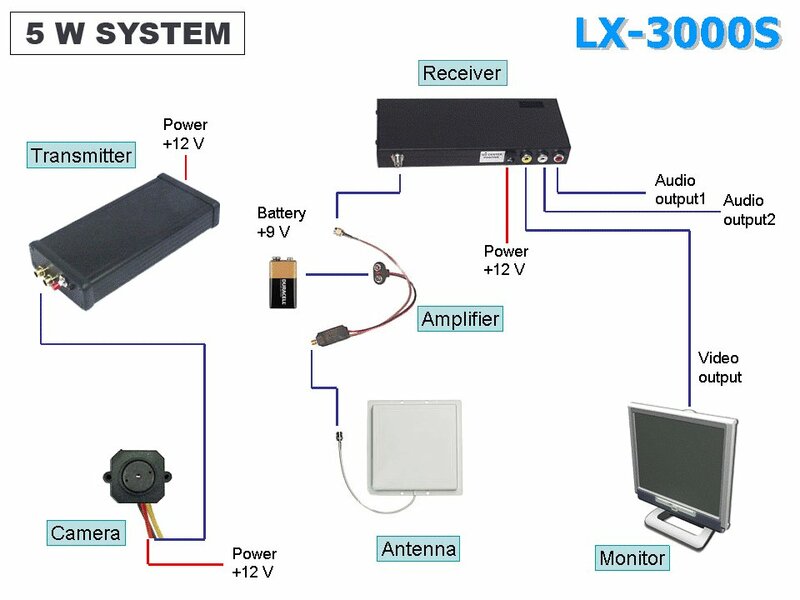 This wireless video system is excellent for Micro Aircraft Vehicle (MAV) operations, experiments, surveillance etc... Part 90 FCC approved including all receivers VRX series. Smallest video transmitter SDX-22 weights only 3 grams. 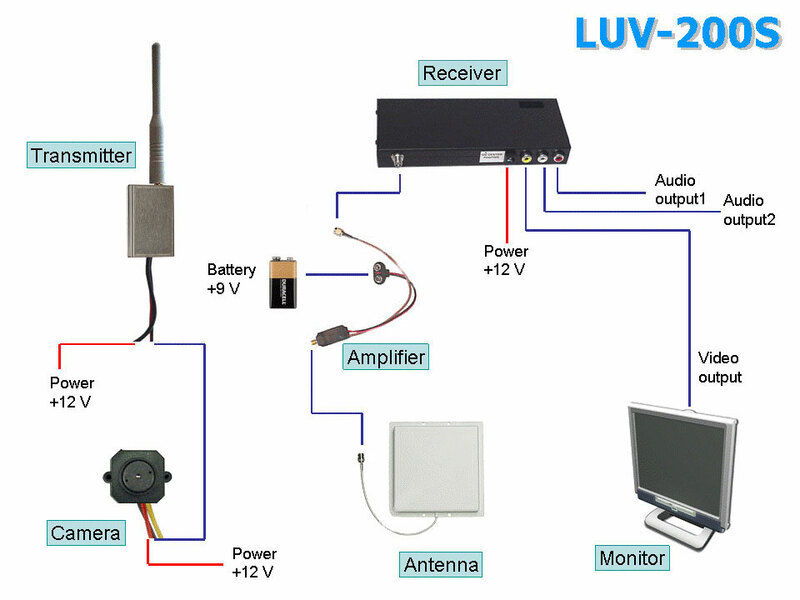 RF power output is 50 mW / 9 V or 80 mW / 12V. This small video transmitter has a great distance from the AIR with receiver VRX-24L, antenna amplifier AMP-18 and a high gain antenna on the receiving end. Rf-links presents the most powerful, long range 2.4 GHz system, tested for long distance over 40 miles from the air. The new system includes transmitter, receiver, high gain antennas and all cables. The transmitter has an option of changing the channels remotely (1-8). Rf-links presents the smallest, long range 2.4 GHz system, tested for distance over 1 mile from the air. The new system includes transmitter, camera, receiver , high gain antennas and all cables. Rf-links presents the smallest, very long range 2.4 GHz system, tested for distance over 10 miles from the air. The new system includes transmitter, camera, receiver, high gain antennas and all cables. Rf-links presents the smallest, very long range 1.7 GHz system, tested for distance over 1-2 km ( 5-6 km with amplifier ) from the air. The new system includes transmitter, camera, receiver, high gain antennas and all cables. Rf-links presents the smallest, very long range 1.7 GHz system, tested for distance over 5-6 km from the air. The new system includes transmitter, camera, receiver, high gain antennas and all cables. 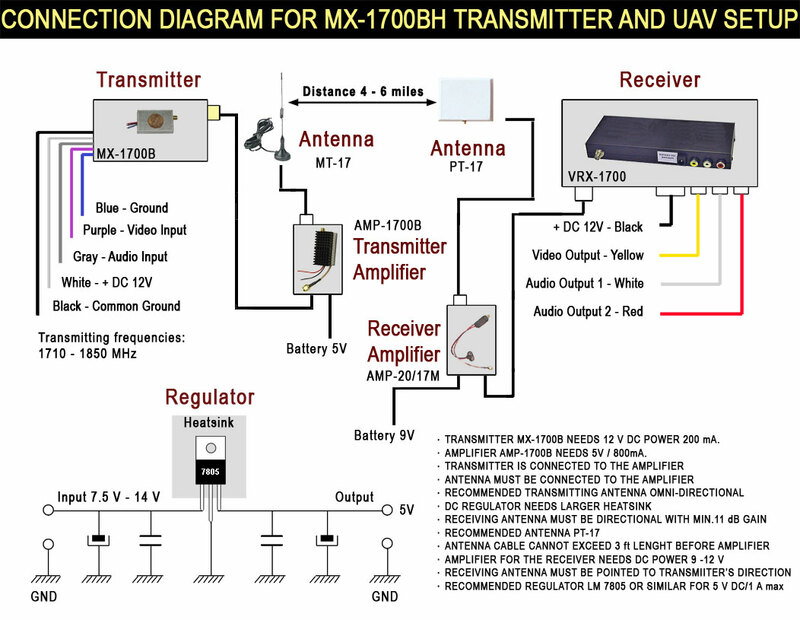 New Digital UHF Video Transmitter model HD-1000 is a fully synthesized audio/video transmitter for UHF band from 25 MHz-1000 MHz. It is a Military grade unit that covers the wide frequency range. The RF power output power is 1000 mW, 2 W (Model HD-1000/2) or 10W (Model HD-1000/10). It sends a crisp color picture and sound miles away. This transmitter will encode a single uncompressed program derived from devices with HDMI, Component Video or VGA outputs to HD MPEG2 video. Supports 480i, 480p, 720p and 1080i resolutions. 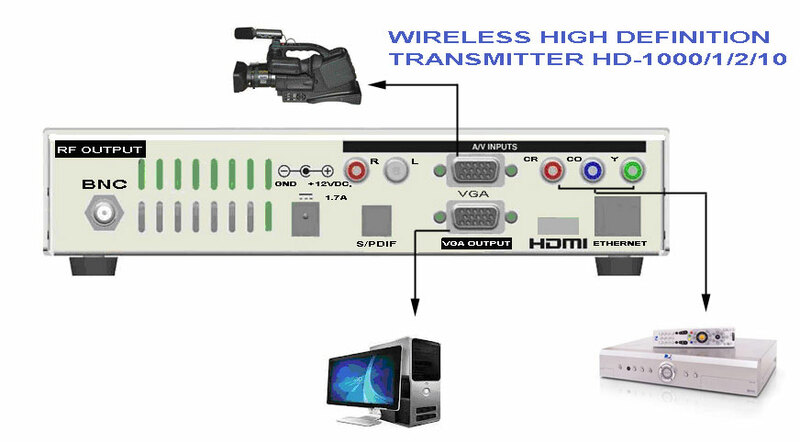 This transmitter accepts Component Video signal, also it has built-in a Composite Video input, and VGA input as well. Sold exclusively to Government agencies or Military forces. Dimensions: 12.8 " X 3.5 " X 6.75 ". This is the long range microwave system 5,8 GHz 2 W RF power, tested for long distances over 18 miles from the air. The new system includes transmitter, receiver, antennas are sold separately. Rf-links.com presents the most powerful, long range 2.4 GHz system, tested for long distance over 150+ miles from the air. The new system includes transmitter, receiver , high gain antennas and all cables. The transmitter has an option of changing the channels remotly (1-8). This is the long range microwave system 5,8 GHz 5 W RF power, tested for long distances over 40 miles from the air. The new system includes transmitter, receiver, antennas are sold separately. This is the smallest, long range microwave system, tested for long distance over 6 miles from the air. The new system includes transmitter, receiver, high gain antennas and all cables. This is the long range microwave system 4,9 GHz 5 W RF power, tested for long distances over 20 miles from the air. The new system includes transmitter, receiver, antennas are sold separately. Alternatively, you may visit www.rf-links.com to review the products.